He uttered those four syllables on his radio show Monday morning, and then several more times during his news conference in the afternoon. What happens when Earl Thomas repeatedly skips practices simply because he feels disrespected? “There’s always consequences,” Carroll said. When Carroll’s teams were winning – be it in Seattle or at USC – he’d get credit for creating a culture that let players express themselves in ways you wouldn’t see elsewhere. It was praised as a recipe for maximizing production from some of the most explosive personalities in the NFL. But when Carroll’s teams aren’t winning, that approach can suddenly look more flawed than it does favorable. Can stars get away with whatever they want? And if so, does that ultimately impede success? From wearing Kam Chancellor’s jersey during his holdout, to rehabbing in Oakland, to skipping the team bus before Seattle’s first-round playoff game, Marshawn Lynch seemed to spend the 2015 season indifferent to authority. Perhaps you could say the same of his 2007, ’08, ’09, ’10, ’11, ’12, ’13, ’14 and ’17 seasons, but in ’15, Lynch was still back in the starting lineup for the second round vs. Carolina. In 2016, Richard Sherman had a pair of sideline rants in which he went ballistic on coaches – then openly criticized the decision to throw the ball from the 1-yard line vs. the Rams. It was a combination of insubordination and indignation, as he was clearly needling Carroll for his infamous play call in their last Super Bowl. Sherman didn’t miss a down, either. Now there’s Thomas, whose ongoing defiance might be the most egregious of the bunch – and yet, from the outside looking in, it hasn’t seem to have bred any repercussions. Of course, “from the outside looking in” is the operative phrase here. Asked about the ostensible lack of discipline Monday, Carroll pushed back. This is true. We don’t know what goes on behind the scenes. Maybe there are punishments commensurate with the offense that we simply don’t hear about. But in terms of playing time or monetary retribution, the perception is that the Seahawks can walk all over the brass and walk away scot-free. Sure, Seattle did jettison Percy Harvin after reports of locker-room altercations and a lack of in-game commitment. And they didn’t give Sherman what he wanted when his contract was up. 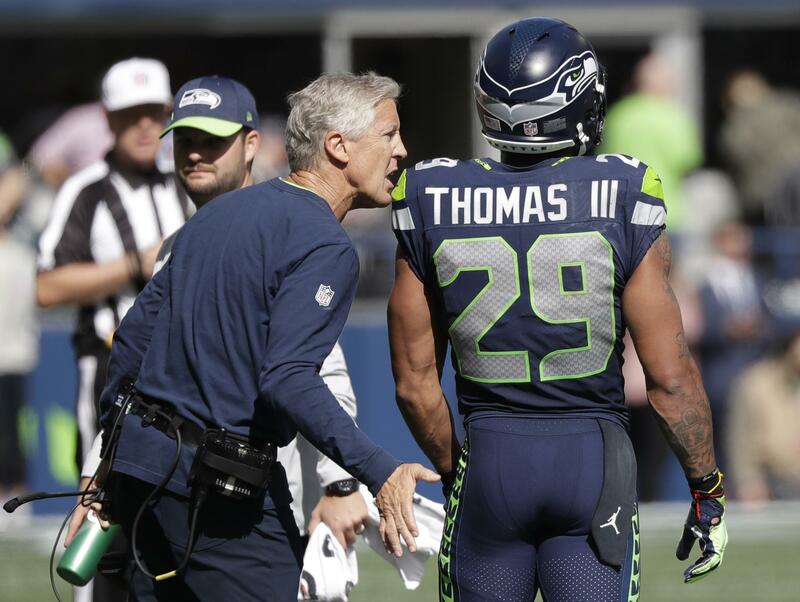 Perhaps there was a chance the Seahawks would have extended Thomas by this point given his performance through three games, but the “consequences” are them refusing to so in the wake of his antics. But the bigger question is: How much would heavy discipline even help Carroll’s cause? Like Lynch before him, Thomas seems universally beloved by teammates. Had you walked around Seattle’s locker room after his two interceptions Sunday, you wouldn’t have found a player peeved with his practice-is-optional approach. That might not be the case if the Seahawks drop three of their next four, but it is now. Also, like Lynch and Sherman before him, Thomas’ behavior doesn’t seem to affect his performances on game day. With 13 games to go, he already has more picks than he did in each of the past two seasons, and is just two shy of his career high. Given his interest in protecting himself, he probably wouldn’t mind being benched. But given his production thus far, such a decision would more likely anger the other 52 Seahawks than it would appease them. I don’t envy Carroll in this situation. My first instinct is to say to just cut bait with Thomas the way someone such as Bill Belichick probably would. It doesn’t seem possible to foster a healthy, winning atmosphere when your star safety repeatedly dismisses you. Wouldn’t this just give other players the green light to do the same when they’re unhappy? At the same time, this is delicate. If the Seahawks can’t find an appealing trade package in exchange for Thomas, they’re going to need him to play at his Hall of Fame potential to have any shot at sneaking into the postseason. Carroll risks losing his authority if he lets Thomas continue as is. He risks losing games and more of his players if he comes down too hard. In other words, no matter which route Carroll picks, he’s going to have to deal with the consequences. Published: Sept. 26, 2018, 4:03 p.m. Updated: Sept. 26, 2018, 5:29 p.m.